We’re big fans of TripIt, a nifty site that creates customized travel itineraries from travel confirmation emails. Today, the service is becoming even more useful by integrating Yapta.com, an airfare and hotel tracking service, into its platform. Yapta lets you track fares from most of the major domestic and international airlines, allowing users to select flights to track, and then be alerted when the price fluctuates. If the price declines after you purchase it, Yapta will help you get a refund or credit from airlines that have lowest guaranteed fare policies. 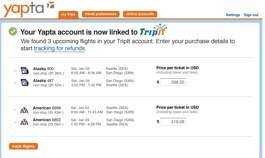 Travelers can now forward their flight confirmation emails to plans@tripit.com and can choose to have Yapta start tracking their flights for airline refunds or credits. TripIt members can then link their account to Yapta in order to be alerted when they are eligible for a refund or credit based on an airline’s “guaranteed airfare” policy. Yapta, which has been able to gain a steady group of consumer followers since its launch in 2007, is revealing a few compelling statistics about airfare price fluctuations. To date, Yapta has conducted approximately 500 million airfare price checks, showing that seat prices on 45 percent of flights will drop before the cabin door closes. Approximately 15 percent of these flights are eligible for a refund or credit and since May 2007, Yapta has identified over $250 million in savings for its members, an average of $334 per traveler each year. Yapta stands to gain a new influx of users with the integration with popular service TripIt. It’s made Michael’s list of products he can’t live without for three years running, and is quickly gaining fans among frequent travelers. Yapta also offers a companion hotel price tracking service.